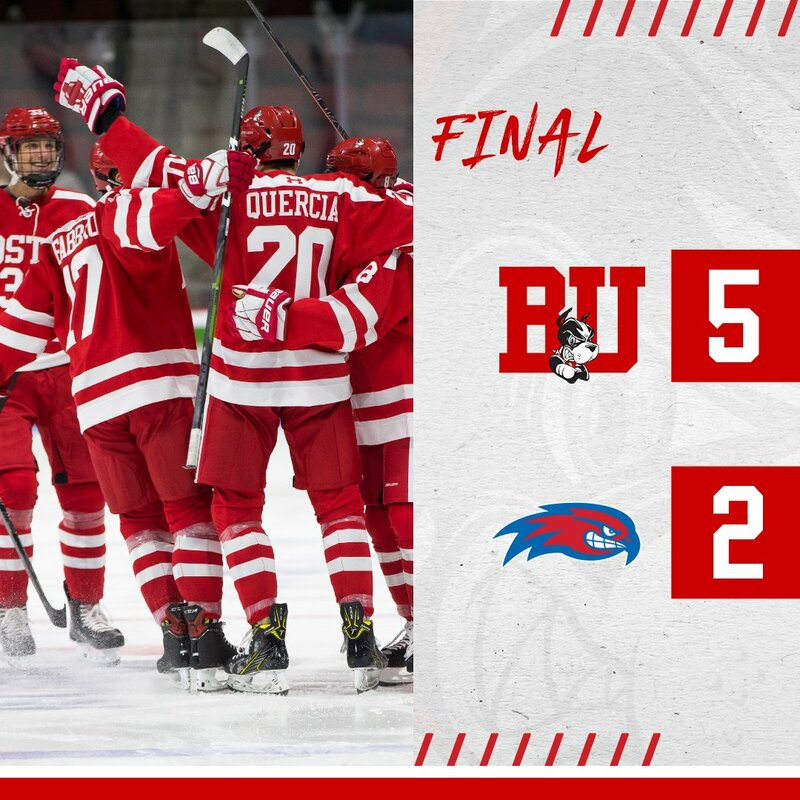 Behind two-goal nights from both co-captain Bobo Carpenter and Shane Bowers, and a strong 40-save performance by Jake Oettinger, BU defeated UMass Lowell, 5-2, at the Tsongas Center, ending a four-game skid. Patrick Curry also scored for the Terriers and had a career-best three points. BU played its best opening period of the season scoring three times in a four-minute span. At the ten-minute mark, Carpenter took a Kasper Kotkansalo pass in the high slot, spun around and whipped a shot past goalie Tyler Wall. Three minutes later, Kotkansalo fed Bowers in the neutral zone and the sophomore center raced into the Lowell zone, then fired home a backhander from the right circle. Then with Lowell on a power play, Carpenter scored shorthanded, converting the rebound of Curry’s initial bid. The River Hawks got one back on the same power play when Charlie Levesque got behind the Terrier defense and beat Oettinger with a backhander. Midway through the second period, Lowell cut the lead to one on Mattias Goransson’s slapshot from the top of the left circle. The River Hawks had 14 shots in the middle period but Oettinger stopped several grade A shots to keep BU in the lead. 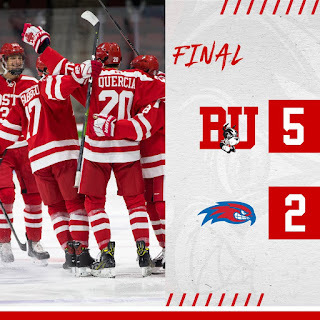 Curry scored a power play goal early in the third, assisted by Max Willman and David Farrance, to give BU a 4-2 cushion. Then with three minutes left, Bowers, again racing into the Lowell end of the ice, took a pass from Curry, closed on the net and backhanded a shot past Chris Hernberg, who had replaced Wall. 2019 recruit Case McCarthy scored a goal and an assist in the NTDP U18s’ 6-4 win against Maine. Trevor Zegras scored a power play goal, assisted by Domenick Fensore. 2019 recruit Robert Mastrosimone scored a goal and an assist in Team USA’s 3-1 win against Canada East in a World Junior A Challenge pre-tournament game. Jakob Forsbacka Karlsson scored his third goal, assisted by Matt Grzelcyk, in the Bruins’ 6-3 win against Toronto. Grzelcyk and Charlie McAvoy, a defense tandem at BU, were paired on the Boston blueline. Led by Jesse Compher’s career-best five points (1G, 4A), BU blanked RIT, 8-0, to complete a weekend sweep and stretch its winning streak to five games. 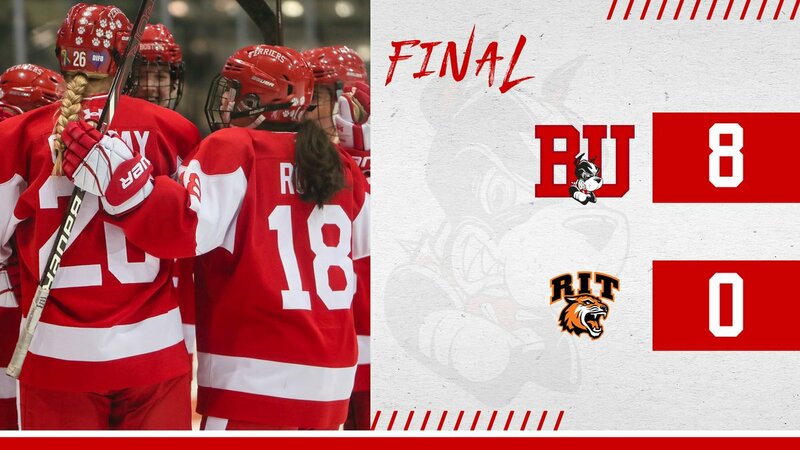 Terriers also received goals from Courtney Correia, Sammy Davis, Deziray De Sousa, Abby Cook, Kaleigh Donnelly, Natasza Tarnowski and Nara Elia. Corinne Schroeder stopped 22 Tiger shots in 50 minutes before being replaced by freshman Nicole McGuigan in her first college appearance.